The Earth’s oceans are home to over 350 species of sharks, ranging in size from the 7-inch dwarf dogshark to the 50-foot whale shark. These magnificent animals have a fossil record dating back over 400 million years, placing them among the most ancient species of fish on the planet. As a keystone predator, sharks play an integral role in maintaining the structure and stability of marine ecosystems throughout the world. Most species of sharks are “cruisers,” meaning they continuously move through the water in search of prey. Their relatively lightweight skeleton is composed entirely of cartilage, allowing them to swim extremely fast while retaining unparalleled agility. In addition, their liver contains large amounts of oil, which ultimately increases their buoyancy. Another main difference between sharks and bony fish is the manner in which they attain oxygen from the water. Bony fishes have a single pair of gills with a muscular covering that contracts to force oxygen-rich water over their gills. Sharks lack this muscular covering and therefore must continuously swim in order to uptake oxygen and keep from suffocating. That is why sharks have between 5 and 7 pairs of gills. Sharks also possess a sensory organ that is fairly unique among fishes. A network of tiny canals known as Ampullae of Lorenzini are scattered across the front of their face. These sensitive indentations allow sharks to sense the slightest change in electrical current given off by the muscle contractions of their prey. 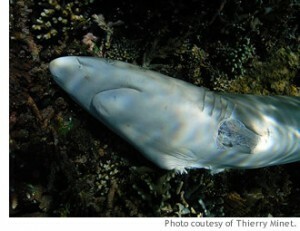 In many cases, sharks sense this electrical fluctuation before seeing or smelling their prey. These organs are also highly attuned to the Earth’s magnetic field, enhancing a shark’s ability to navigate over long distances. One of the most devastating practices in the fishing industry today is the removal of shark fins for use in expensive soups. Known as “shark finning,” fishermen catch large numbers of sharks, cut off their top and side fins then drop them back into the water. Unable to swim, the sharks sink to the ocean floor where they slowly suffocate. This fate is certain, as sharks need to swim in order to pass oxygen over their gills. The sharks may also be slowly eaten alive by scavengers or other predators. As long as there is a demand for their fins, sharks will continue to suffer at the hands of this rogue industry.